You will earn 14,390 Reward Points. Earn 1 reward point for every 1 dollar spent. 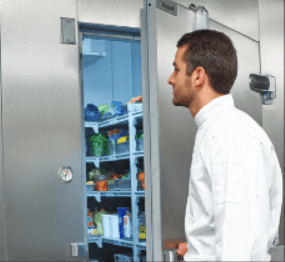 The Kolpak KF7-1018-C8-F10 Kold-Front Walk-In Combo features a 10-foot freezer section that cools at a low temperature of -10°F, and an 8-foot cooler section that maintains a medium temperature of 35°F. This unit features a 26 ga. embossed galvalume interior and exterior, a .100 smooth aluminum floor, and a standard 34" x 78" door. It can be used indoor or outdoor. It is 90 inches tall, 116 inches wide, and 208 inches deep. The ArcticFox Temperature & Air Defrost Control is designed to simplify refrigeration cooler controls by combining the functions of a thermostat and defrost timeclock. The ArcticFox Temperature & Air Defrost Control designed for medium temperature applications 35°F and higher provides a built-in defrost clock that may be used to perform time-initiated and time terminated defrost cycles. The controller’s single-pole-double-throw relay controls the refrigeration and defrost cycles. ArcticFox Temperature Control for low-temperature application provides an easy-to-understand thermostat, which simplifies operation and eliminates end user frustration. The ArcticFox has been integrated to provide optimal performance and includes a battery powered clock that will ensure proper operation once power is restored. Post Defrost Indicator To eliminate unnecessary/unwarranted service calls, the ArcticFox Temperature & Air Defrost Control (for Medium temp applications) alerts the user when it is coming out of a defrost cycle using the onboard display. The display alternates between dEF and the actual temperature measured by the air sensor. This continues until the temperature has reached setpoint, or for the amount of time set by dFt (Defrost Time) whichever is shorter. The space temperature sensor is supplied with a 45-inch lead, and functions to control the space temperature of the room. The ArcticFox Temperature & Air Defrost Control and the ArcticFox Temperature Control include RS-485 Modbus communication.